The new Ford Focus RS will come as standard on Michelin Pilot Super Sport 235/35 ZR19 road tyres front and rear, with the option of more track-focused Pilot Sport Cup 2 tyres as an extra. Choosing tyres that matched the characteristics of the car was very important for Ford’s chassis engineers, and following extensive road and track testing, the Michelin tyres were chosen. David Put, Ford development engineer and driver commented: "The Michelin Pilot Sport Cup 2 tyre offers a surprising level of grip thus reducing lap times on the track, while bringing a highly appreciable level of precision to road handling for the Focus RS, while maintaining its playful, dynamic character. This is all thanks to the joint work carried out by the Michelin and Ford Performance teams, with a level of mutual understanding which enabled us to promote the wild temperament of the car." Both tyres share technologies developed in Motorsport, including a variable tension high-density fibre belt to ensure high-speed stability. Due to its variable tension, the belt tightens the tread area more than the shoulders and as a result, centrifugal force is more effectively overcome and pressure is more evenly distributed throughout the contact patch. The tyres also features a Bi-Compound tread, which was originally developed for racing tyres, where different rubber compounds are used on the left and right sides of the tread to ensure high and consistent grip levels in a variety of weather and road conditions. Michelin Pilot Super Sports employ Variable Contact Patch 2.0 which means that although the contact area’s shape changes when cornering, the amount of rubber in contact with the road remains the same for consistent and high levels of grip. 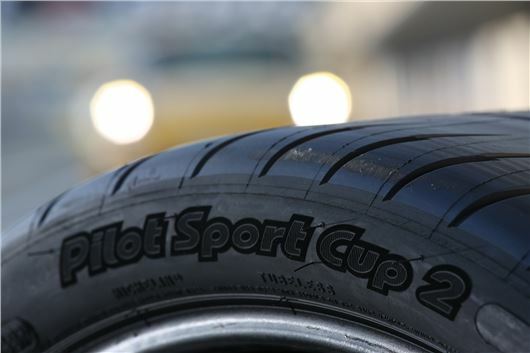 Developed from this, Michelin Pilot Sport Cup 2 uses Variable Contact Patch 3.0. This optimises pressure in the contact area of the tyre to ensure that the same amount of rubber is in contact with the track whether the car is driving in a straight line or cornering. The technology is combined with the Track Longevity Patch, which consists of a third specific rubber mixture for the shoulders, ensuring a longer life during track driving. These technological tyre innovations, which were developed on racetracks around the world, and Michelin’s commitment to its Total Performance strategy mean that drivers can take full advantage of the advanced chassis and driving dynamics of the Ford Focus RS.